The Psychology of Women 7 Edition This highly respected, best-selling book offers an enjoyable, extraordinarily well-written introduction to the psychology of women. Appropriate for readers from a wide variety of backgrounds, this comprehensive book depicts women's experiences through direct quotations and an emphasis on empirical research. Known for its balance of scholarship, readability, and inclusion of various kinds of women, the text reflects a genuine interest in and understanding of the readers for whom it was written. 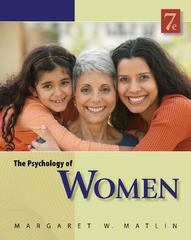 THE PSYCHOLOGY OF WOMEN includes a chapter on old age as well as discussions of topics such as welfare issues, pregnancy, and women's retirement, which are central in many women's lives but not consistently covered in other texts.